Peggotty is Sydney Burleigh’s boat-bottomed, thatched roofed artist’s studio. LCHS celebrated Peggotty’s 100th Birthday in 2006 and has kept a watchful eye on its condition. Hurricane Sandy damaged Peggotty’s display building, and at the same time we were becoming more and more concerned about the stability of the boat cradle that supports the structure. After last winter, we felt the need for preservation was urgent. Peggotty’s cradle and display building needed to be replaced immediately. 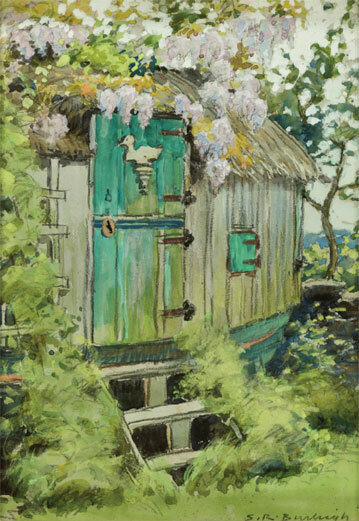 Peggotty is the boat-bottomed, thatched-roofed artist’s studio of Little Compton artist Sydney Burleigh. Burleigh named Peggotty after David Copperfield’s nursemaid who lived in an overturned boat. In 1906 Burleigh found an abandoned catboat on Taylor’s Lane. It was originally part of the ferry system between Little Compton and Aquidneck Island. 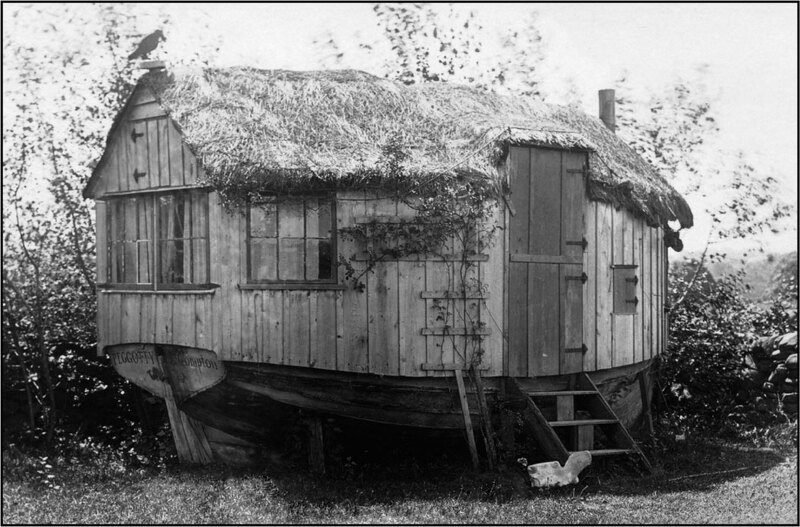 He took the boat to his home on West Main Road, built the studio on top of it and thatched the roof himself. Peggotty served as Burleigh’s Little Compton studio for the last 30 years of his life. The Catboat Association believes that Peggotty’s base is the oldest catboat still in existence. 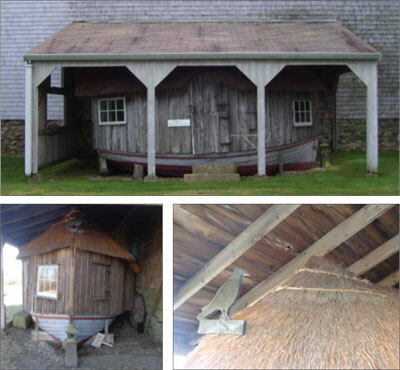 In 1962 Mr. and Mrs. Roy Kimmell donated Peggotty to the Historical Society where it was displayed and re-thatched under the direction of Carlton Brownell. In the 1980s it was moved into a shed on the property for protection from the elements. Today Peggotty is a gem in the Historical Society’s collection and is on permanent public display. Burleigh’s trick photography places him in this photo of Peggotty twice. Sydney Burleigh (1853-1931) is one of Little Compton’s best-known artists. He created hundreds of works of art during his lifetime, including many Little Compton landscapes. The only child of abolitionist George Burleigh and Ruth Burgess Burleigh, Sydney spent his youth in Little Compton. Living in Providence as an adult, he returned each summer to “The Owl’s Nest” his family home near the corner of West Main and Swamp Roads. A Turn-of-the-Century Renaissance Man, Burleigh worked in watercolors, oils, iron, wood, glass and photography. He designed theatrical costumes, introduced Little Compton to the game of tennis, and even established a toy company when World War I stopped the importation of German toys. Burleigh was one of the original members of the Providence Art Club, and his Fleur de Lys Studio in Providence was the first dedicated public art studio in the United States. 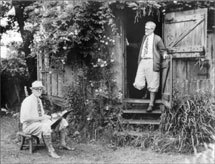 He created Peggotty, his beloved Little Compton studio, in 1906. Peggotty’s failing boat cradle needed to be replaced immediately. Peggotty Needs Immediate Structural Support. Without It, a Collapse is Inevitable. 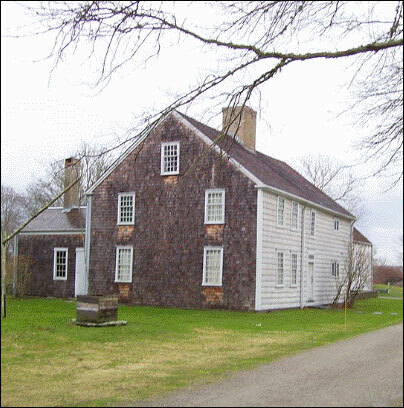 Recent inspections showed that Peggotty was in urgent need of preservation. The Little Compton Historical Society made the preservation of Peggotty its top priority. 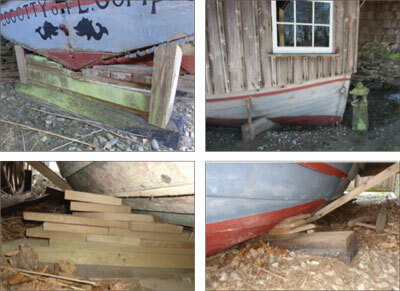 Peggotty’s boat cradle was failing and needed to be replaced immediately in order to prevent a structural collapse. The boat’s keel and portions of its ribs were lost at some point in Peggotty’s history and needed to be replaced/reinforced to lend strength to the structure. The weight of the studio and its thatched roof would eventually have crushed the boat underneath. Their weight needed to be supported, instead, by a specially designed cradle that ties into the studio and the roof. Peggotty’s undersized, damaged storage building needed to be replaced. Peggotty’s former storage building was damaged during Hurricane Sandy and needed to be replaced. The building was located in an out-of-the-way spot. Many visitors came and went without ever seeing Peggotty. Its small size did not allow visitors to fully see and enjoy Peggotty and did not provide the air flow necessary to prevent mildew and rot. Its low ceiling prevented the proper re-thatching of Peggotty’s roof in 2006. Constructed a custom-designed boat cradle for Peggotty providing proper support to the boat, the studio and the thatched roof. Relocated Peggotty to a more visible location to emphasize Peggotty’s importance to the collection and provide easy visitor access. Constructed a new, larger display building for Peggotty to improve its storage conditions, ensured its long-term preservation and provided a more positive visitor experience. Equipped the display building with Hurricane Screens rated for Category 5 hurricanes.